What's for dinner? It's the dreaded question that plagues all of us in the evening hours. When we're tired from a long day, the last thing most of us want to do is make another decision. So, we reach for fast food or find some other quick solution to stave off our hunger pains. Instead of offering another take-out option, Lake Trust business members Dan and Liz found a unique way to help families enjoy mealtime again. 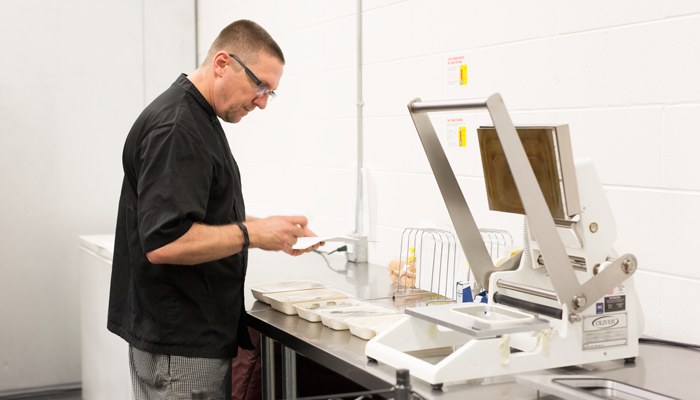 In their commercial kitchen in Rochester Hills, something magical happens each day. Dan and Liz, the husband and wife duo behind The Wandering Gourmet*, a personal chef service, solve the dinner dilemma by planning, cooking, and delivering meals to busy families across Metro Detroit. Their venture into small-business ownership came to life fourteen years ago during the downturn of the automotive industry and local economy. Though Dan has been cooking since he was 10 years old, he had never seriously considered it as a career until his job as a tool and die maker hit a roadblock. After, yet again, being laid off by his employer, Liz convinced Dan to take a chance on his love of cooking and get certified as a personal chef. Since she was just as passionate about this endeavor, Liz jumped in to handle the client consultations and business operations. When he was called back to work at the tool and die shop, Dan juggled his job working at the plant and preparing meals in private homes. One day, he was given a choice: either work full-time or pursue his recently acquired business, The Wandering Gourmet. "It was a no-brainer," Dan says about making the leap. "We both enjoyed what we were doing together." Fresh is Best. Dan and his staff are conscious of only using fresh, high-quality ingredients. Ready to Eat. After cooking each meal, Dan packages up the food for delivery. Time for Dinner. Each dish looks as good as it is to eat. 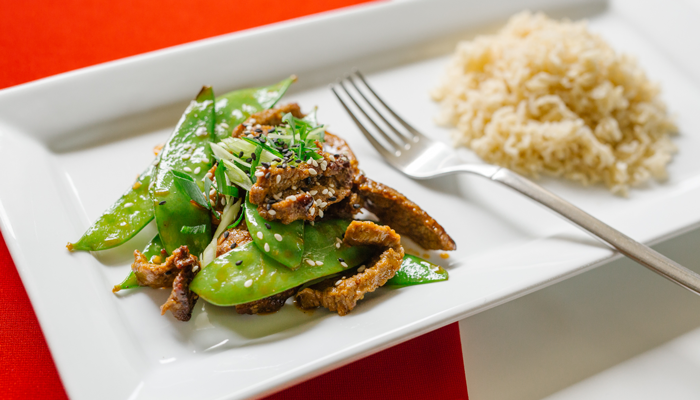 Featured is the beef stir fry. Fourteen years later, The Wandering Gourmet now provides meals to 100 families each month. Within every bite, the amount of craft and care that goes into each meal is tasted. The food is not the only thing that makes The Wandering Gourmet so popular; it's the personal touch. During the initial client consultation, Liz notes everything from the amount of spice to the type of tomatoes a client likes in a salad. Unlike many online subscription food services, each meal that Dan and his staff creates is customized to an individual's tastes and dietary preferences. And everything from salad dressing to dessert is created from scratch. The staff at The Wandering Gourmet shops daily, hand-selecting the freshest ingredients available. 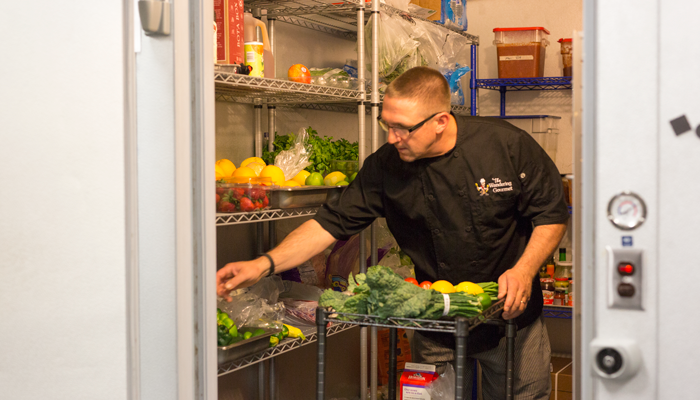 After the meals are prepped, cooked, and packaged, they are delivered to clients extending beyond the Metro Detroit area. From elderly folks who can't get to the grocery store to busy working professionals, each delivery offers a sigh of relief for clients who simply have to warm up their meals with no cooking or clean-up involved. Dan and Liz understand how difficult it can be to balance work schedules, school, and activities; not to mention the time needed to make a homemade family meal. Though our lives are increasingly busy, Liz reiterates the importance of the family meal: "Dinner is especially important today. We're all digitally connected, yet even when we're in the same room we forget to interact with each other. Dinner should be a time to relax, recharge, laugh, tell stories, and catch up on the day’s ups and downs." The Wandering Gourmet is so much more than a personal chef service. It's reestablishing the family dinner as a sacred time to communicate and bond. One of the many joys of owning their own business is the freedom to get creative and find new ways to grow. Dan and Liz recently launched a new local meal delivery service called Now Plating. Their excitement to learn and experiment with new opportunities has certainly contributed to their success. "You will live, breathe, and eat the business. But if it's something you enjoy, it's very rewarding. If you have a passion, go for it," says Liz of taking the leap into small-business ownership. Dan echoes, "There's nothing better than working for yourself." Though owning their own business takes a great deal of hard work and dedication, Dan and Liz have found great fulfillment in the chance to act out their passions and help families reconnect again. *Third party website. Lake Trust Credit Union is not responsible for the content, availability, security or compliance of any linked third party websites. In addition, the site's privacy policies may differ from those of Lake Trust.